Preserved vegetables such as preserved turnips, adds delicious flavours to a dish. Scald the pig’s tail in a pot of boiling water for about 5 minutes. Rinse and drain. Cut preserved turnip into shreds then soak for at least 30 minutes. Rinse well and set aside. 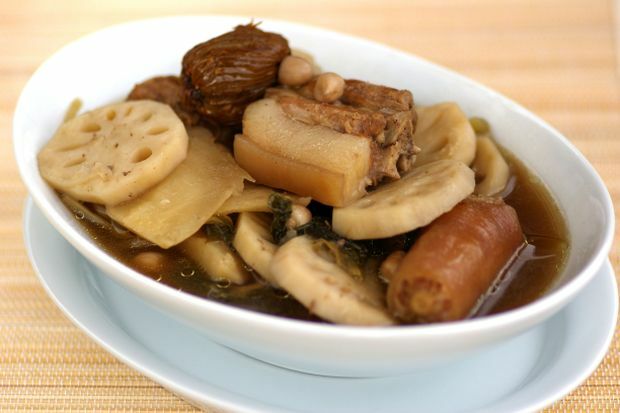 Heat some oil in a deep claypot and fry the tail, preserved turnip, lotus root and peanuts until aromatic. Add all the dates and the seasoning, and pour in water. Bring to the boil, cover, and reduce the heat. Simmer for 1 1/2 hours, or until meat and peanuts are tender. Add the rice wine and season and thicken to taste.